I’m a student (in electronic engineering), and I’m broken as… a student! Yet I am like a child who wants a toy: a quadcopter! My quest to have such a thing has been quite easy, until I had to choose a Transmitter. Finaly a nice box containing a FlySky FS-i6 arrived at my door. It is a 2.4GHz 6 channels transmitter, which can also do telemetry. It has 6 channels… 6 channels is good, but 14 is better! A servomotor has 3 wires: ground, +5V and a signal wire. 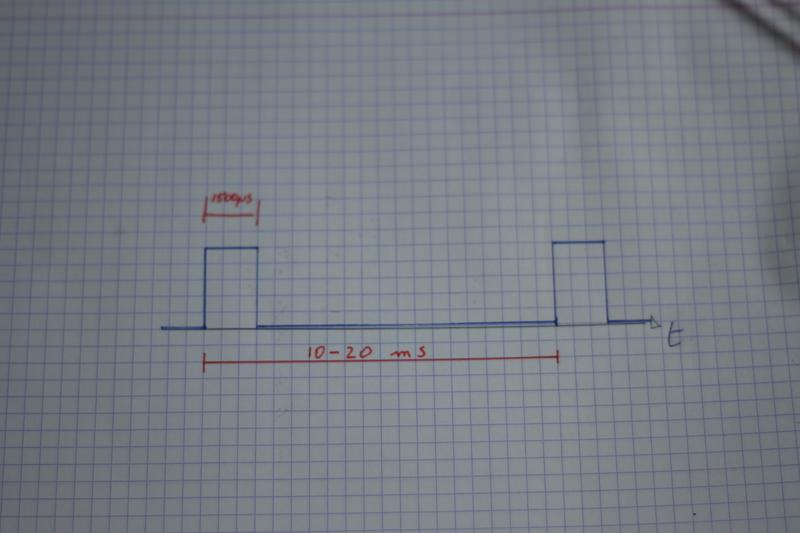 The signal is a PWM and its pulse width (in µseconds) is the transmitted value. It gos typically from 1000 to 2000 with 1500 as a middle, default, point. 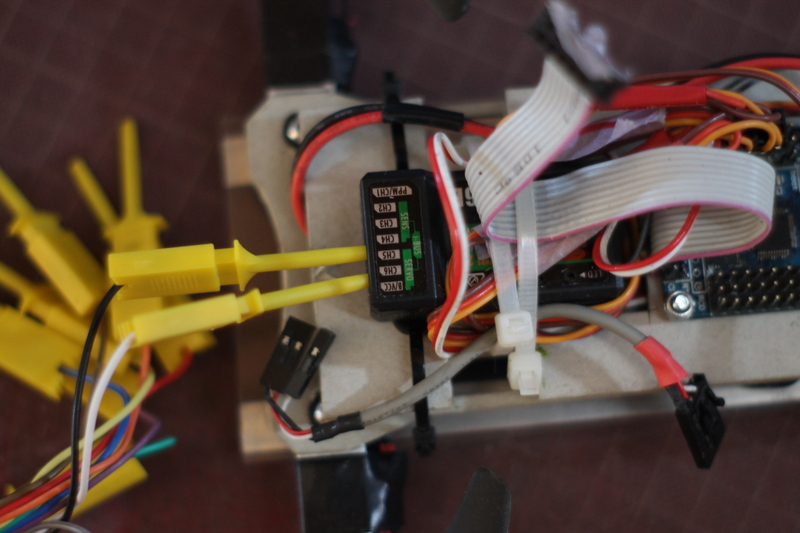 In the case of a quadcopter, these commands are given to a flight controler (FC) wich translates them to motor commands. The FS-i6 has an IBus interface. It means that it can communicate the servocommands to the flight controller by some kind of serial communication. It has the advantages to limit the number of wires between Rx and FC, but also to use a pure digital transmission. Bingo, the 3rd and 4th byte equals 0x05DC (they are sent in reverse) and the 5th and 6th equals 0X05DB. We recognize a header of 2 bytes, then 12 bytes for our 6 channels and at the end 2 bytes of footer, maybe a checksum (?). Between the end and the 6 channels, suprise!, we see 8 more channels, fixed at 1500! This could bring the numer of channels to 14! Publié dans English.Tagué en, flysky, quadcopter. It is fantastic to see one people that try to explain what an i-bus is in the electronic sense. Therefore, i can use you this information in order to design a decoder with a FPGA and use it for student. If I remember correctly, there is more information about the protocol in the betaflight and/or cleanflight github repositories, as they are flight controller firmwares supporting it. I know that the protocol can be used to send channel information, but also to receive telemetry data, which could be interesting for your courses. Try also RCgroup forums, maybe you’ll find some documentation there too. I¡¦ve been exploring for a little bit for any high-quality articles or blog posts in this sort of house . Exploring in Yahoo I finally stumbled upon this web site. Reading this info So i am happy to convey that I’ve an incredibly good uncanny feeling I came upon exactly what I needed. I most indisputably will make sure to don¡¦t disregard this site and give it a look on a continuing basis. What is ibus logic level? 5v or 3.3?